The Franconia Museum 2019 Membership Drive is now underway. If you were a member last year, look out for our membership postcard coming your way. If you've never been a member, Consider doing so by selecting the "Friend" link above. Return to a time and place when freedom and former slaves who desired to educate their children, literally created the school themselves. Freed slaves built this one room schoolhouse in the early 1880's. It served the black children of Franconia until 1932 as the Laurel Grove Colored School. 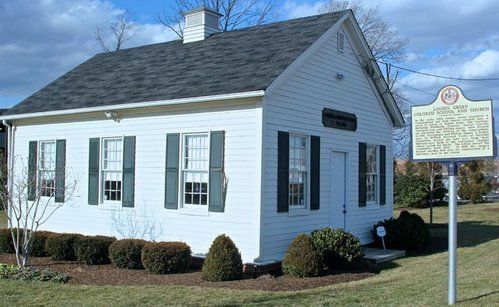 The school survives as the only remaining African American schoolhouse in Northern Virginia. It now stands as a living museum, restored to reclaim its heritage and bring to life its history. Visit to experience a day in the life of a Laurel Grove student, circa 1920. The schoolhouse is open Tuesday, Thursday and Saturday from 10AM to 2PM. The parking is in the rear of the building. • The Franconia Museum preserves the past, present, and future of the Franconia area in pictures, artifacts, and stories. • The Franconia Museum reaches out by educating, enriching, and bringing together the greater community. We are a 501 (c) (3) organization led and run entirely by volunteers. The Museum also does exhibits at local libraries, and other community meeting places throughout the year. The best way to get to know the Franconia Museum is to come to one of our events. We host story-swaps two or three times a year and the Franconia History Day in the fall. Please check our web site often for event and exhibit announcements. If you would like to be on our event mailing list please send us an email at Franconia Museum. If you have a story to tell or a picture, artifact, or map to contribute please let us know. We are here to tell YOUR story!